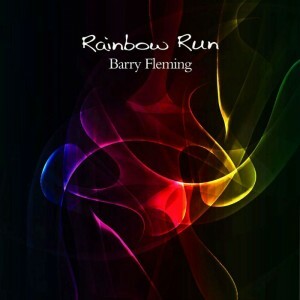 The Rainbow Run album came about after my song Guiding Light was released as a download single. I think it’s fair to say if Guiding Light hadn’t caused such a response from listeners, Rainbow Run would never have existed – not for a long time anyway. I think it’s every singer/songwriter’s goal to produce an album at one time or another, and as I now had a few songs in my catalogue I figured I’d give Guiding Light a platform as well as including some favourites from the Household Honey EP which had been released a short time ago. I think I really just wanted ‘one’ cd with my new stuff alongside a few songs I knew (and hoped) people liked. Anyone who’s been there will tell you – it’s no easy task creating an album. At the time I didn’t have the studio set up I have today. I had 7-8 songs I felt would work, a BR1600 digital recorder and a lot of determination. I wanted a 12-track album, but after getting some crazy quotes from studios, I decided the only way Rainbow was going to work was if I did it myself. The Rainbow Run project took around 8 months to complete. The learning curve was immense as I researched everything I could into recording at home using the equipment I had at my disposal. As I was laying down the tracks I’d already ear-marked for the album, I was also writing songs to make up the 12 which I needed to fill it. Being set up in the front room of the house brings it’s own challenges – it was the family home…not a purpose-built studio. I think there were many times when the family thought I was just mad; but as I mentioned, the determination was there, and this mixed with their support was vital, especially when things maybe weren’t going according to plan. I remember one time having three or four songs completed when I had a major system crash. Although I’d backed up the songs, I’d still lost maybe 40-60 hours work – not a good week. A Welcome Change of Direction from a Bad Experience. While the recorder was off being repaired, I was given the chance to turn my attention more toward the songwriting side of things. It was actually nice to be able to concentrate on ‘one’ thing and not have to worry about the ‘recording’ element which, if I’m being honest, had been taking it’s toll. It was around this time while I was out doing a gig that I met a local guitarist, Michael McGrath. I’d a few ideas in mind which I thought would benefit from some guitar-work and asked Michael if he’d be interested in working on some of the tracks. ‘Common Man’ was the first song Michael helped out with, and still one of my favourite songs on the album. With the Br1600 studio back and working again, I finally had the songs recorded and sent off for digital release (as well as physical duplication) within a fortnight. One of the main factors with producing Rainbow Run which I’m extremely proud of today is that I was on no social media site at the time. Sales were with the help of family, radio play and independent music shops – as well as some live shows. Although I do things very differently today – I have a music page on Facebook and can appreciate the benefits of being a part of such; back then it was very much a sole venture. Rainbow Run is available from all digital music outlets – physical copies are also available from several music stores, as well as from me. Contact me for details.